Mobile Tactics was used as a semi-permanent facility from 2005 to 2010 to supplement a retail firearms business on Marco Island, FL and Naples, FL. In that time thousands of customers used the range, as it was the only indoor firearms facility in Collier County (FL) area. In addition the range became mobile and started serving a very diverse clientele. In 2010 Mobile Tactics developed a new business concept, and as one of only three privately owned, mobile shooting ranges in the U.S., Mobile Tactics truly became mobile. Below are some of the highlights and diverse customer base we have served since that time. April 13-15 2019 Aberdeen, SD Grand Opening of Runnings new store. February 1-3 2019 Phoenix, AZ Mid-States Show annual buyers show, with buyers being able to shoot some of the manufacturers newest weapons. January 7-9 2019 Columbia, SC United Sporting Company/Elliott Bros annual buyers show, with buyers being able to shoot some of the manufacturers newest weapons. April 2018 Miamisburg, OH Ellett Bros. had a one day buyer’s show at their Ohio location, allowing buyers to shoot before they placed orders to purchase firearms. April 2018 Tyler, TX Superior Firearms has a two day event, and a huge sale, where they make the range available at no cost to attendees to shoot a variety of firearms before they purchase. 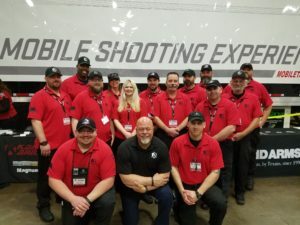 April 2018 Louisville, KY The USCCA annual three day expo with more than 10,000 attendees, gave attendees the opportunity to try before buying more than six different manufacturers guns. April 2018 Lampasas, TX The Hoffpauir Group holds an annual product show for any and all lines of equipment and sporting products they carry, including firearms. The range was available for attendees to shoot a variety of guns. March 2018 Corona, CA Lucas Oil Company signed a long-term lease to utilize the range at an anticipated 40 events nation-wide, partnering with four of the largest gun manufacturers to highlight their guns and Lucas Oil’s outdoor oil products. March 2018 Ft. Worth, TX The Texas Southwestern Cattle Raisers Association annual three day convention allowed attendees to try a variety of firearms made available by more than six different manufacturers who were vendors at the show. January 2018 Columbia, SC United Sporting Company/Elliott Bros annual buyers show, with buyers being able to shoot some of the manufacturers newest weapons. October 2017 Palm Bay, FL Community Champions/Space Coast Harley Davidson sponsored a two day event to benefit law enforcement and highlight Harley Davidson motorcycles. April 2017 Ft. Worth, TX; Tyler, TX; and Bossier City, LA USCCA, Superior Firearms and Davis Clothing all rented the range for a variety of events in Texas and Louisiana. September 2016 Jeffersonville, IN Sig Sauer and Orion Firearms hosted a two day event highlighting Sig Sauer firearms. April 2009 Lakeland, FL Travel Centers of America hosted the range, allowing truckers to come on board and shoot during their down time.